It's a great day! I believe it is replete with great opportunities. One of these great opportunities is the opportunity to make money.It feels good making money. I feel good every time, my joy is not based on circumstances or material acquisition, however, I also feel good when I make money.I don't currently know anyone who feels bad making money, if there is you can share with us in the comment section :) - i love reading your feedback in the comment section below. Today I think I owe a couple of people the need to show you how to make more money. I wish I could give you the keys to the vast wealth of the universe and I am sure that will gladden your heart, but as God will help me I will share vital tips that will do just that. 1. GOD is the Source: I have always learnt and come to terms with this every now and then. You see, this is deeper than i can fathom, but we will simply wrap our minds around it from an angle, Your paycheck isn't your source, your shop or office or no man around you is your source, they are all vital in the flow and scheme of things,however God is your source. THink of the Ocean, all water bodies flow from here and there and still end up in the ocean, the ocean is vast and still feeds other lives the cycle goes on and on. God is your source.So there is abundance all around you, all you need to do now is to access it and the good news is He is interested in giving you not bits of it but as much as THE KINGDOM! You can have everything in life you want, if you will just help enough other people get what they want. " Imagine the growing population of the over 7.5 billions of people in the world we are not likely to run out of opportunities in our entire lifetime and the same is true for generations unborn. 3. Permit Yourself to Be Wealthy: Most people will never permit themselves to be wealthy. They continuously love and reinforce poor, self limiting beliefs and mentality.This is where the first work starts in making money flow to you and becoming really wealthy which transcends just making money today. You need to work on your desires and your belief system. 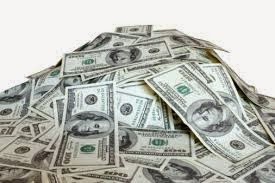 HOW 'BADLY' DO YOU WANT IT, If you really want more money you must have a really strong desire and be read to take positive necessary steps to make it happen in the most legal ways.Your belief system will enhance the achievement of this goal since you now operate from a vantage point with a wealthy and healthy outlook on life. 5. THE POWER OF AFFIRMATIONS: The Yoruba Proverb 'A pe mora eni, l'a npe TEMIDIRE' It literally means to be really blessed and experience success, 'Customize it' 'Personalize It',It must be your personal Confession. To make money flow towards you now, more than ever before, you will need to use the power of positive affirmations. Affirmations are positive confessions, i wrote a article The Power of Positive Affirmations to explain this. I share below some of my favourite wonderful affirmations that I have learnt and continue to share with people; MONEY FLOWS TO ME EASILY! I LIVE AND WALK IN ABUNDANCE; I AM GRATEFUL TO GOD FOR ABUNDANCE; I AM SUCCESSFUL; I AM BLESSED; I AM DAILY FURNISHED WITH ALL THE RESOURCES I NEED TO SHOW FORTH GOD'S GLORY. I MAKE MORE MONEY THAN I SPEND! I ALWAYS HAVE MONEY! THERE IS ABUNDANCE! I AM GRATEFUL TO GOD FOR HEALTH AND WEALTH! Money Comes to Us Easily Today and Always!